British and Australian Piano rolls after 1911 (and as late as 1966) frequently show a publishers mechanical copyright stamp on the leader. 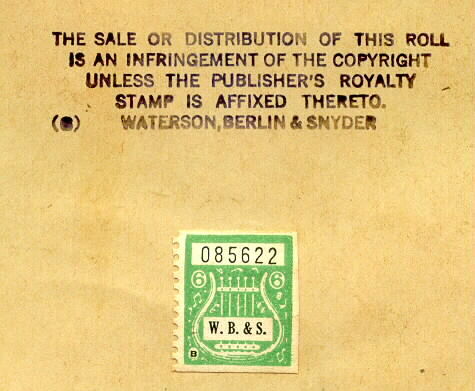 These were issued under the various Copyright Acts and ensuing Regulations following the UK lead in 1911. 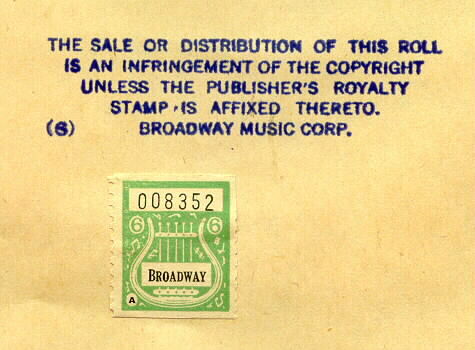 The stamps were also often affixed to 78 records, and some early LPs and 45s (or their sleeves). In all this, the US was a notable exception. US records don't normally bear the stamps except for some examples of speciality labels (United, Standard Disk) pressed around 1910 by Columbia, which bear small 2c or 4c stamps. 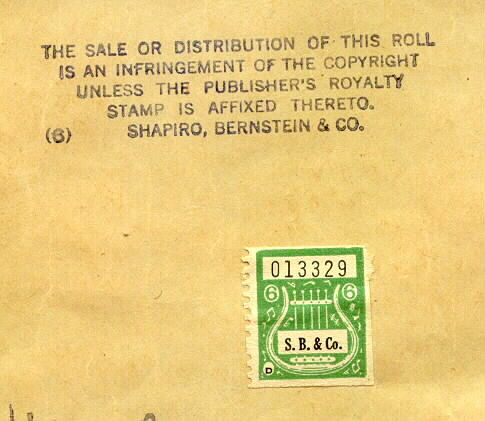 However, in 1918 it appears that some serious attempt was made to use stamps to show the payment of copyrights (royalties) for lyrics on Piano Word-Rolls. This was a private commercial action by the Consolidated Music Corporation - a collective of New York music publishers. 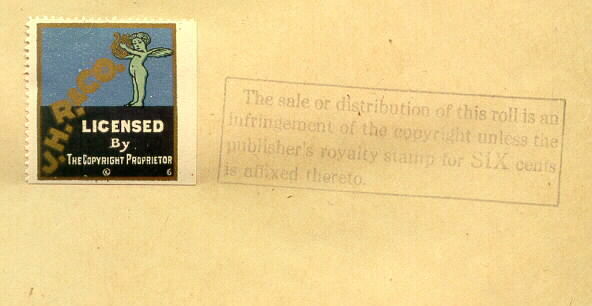 The mechanical copyright of 2 cents was also applied but no stamp was used, the 2c being included in the stamp value. There is a generic series of green stamps, issued in coils (imperforate top and bottom) and featuring a lyre. The publisher's name, serial number and a code letter appear in black. The stamps are valued 6 (cents), or in one instance 12 (cents). In May 1919 the rate increased to 7.5cents minimum with a ceiling of 12.5cents, but no stamps of those denominations have been seen. The generic stamps have been seen from several issuers namely M Witmark; Broadway; Forster; Kalmar, Puck & Abrahams; Waterson, Berlin & Snyder; Shapiro, Bernstein & Co; Stasny; Joe Morris and J.H. Remick. Leo Feist used a similar stamp, but it was inscribed "You can't go wrong with any Feist song"! A different and very colourful stamp was also used by Jerome H Remick & Co.
As the examples below show, the stamps were affixed on the roll leader next to a stamped message relating to the publisher's royalty stamp. The use of the stamps ceased in late 1918, and were replaced by an auditing system. Some samples are shown below. Vocalstyle 10839 There's A Long Long Trail (copyright 1913) 12c on $1.00 roll.